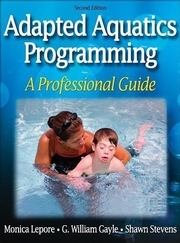 educates professionals on providing safe and effective adapted aquatics programs. instruction in providing safe and effective adapted aquatics programs. Text for adapted aquatics instructor courses. A reference for instructors of adapted aquatics professionals who teach or coach in inclusionary aquatics programs and others who teach swimming or manage aquatics programs.